The UPCAT is almost here and I know a lot of you are already feeling the pressure and tension brought about by the test. Kinakabahan na ba kayo? 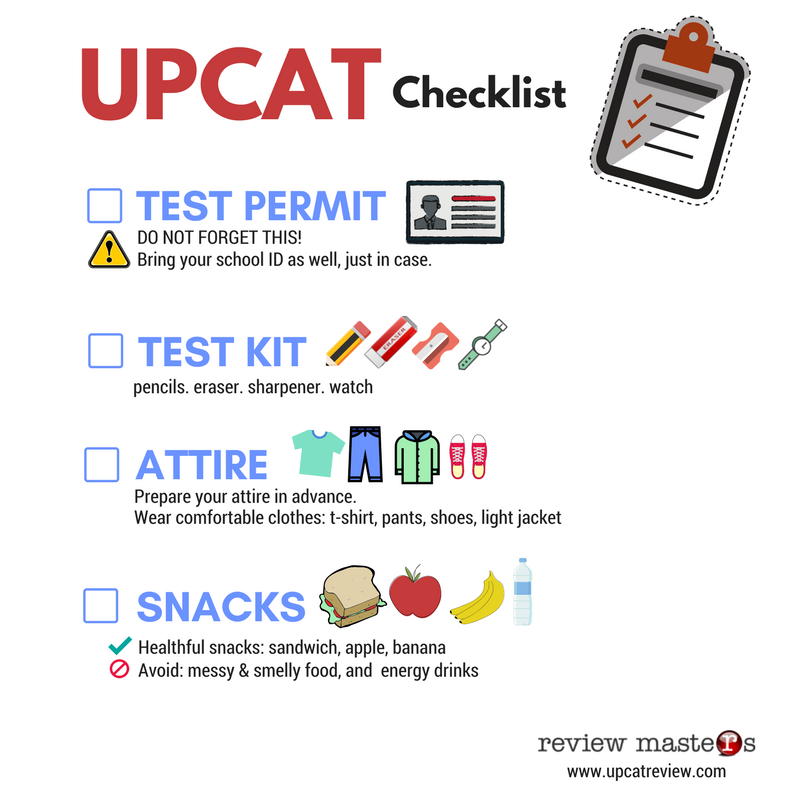 To help you out, here are 5 things that you need to do a few days before the UPCAT. You do not have to review a few days before the test. Avoid going through books and reading notes. It won't really help at this point in time. Answer multiple choice exams. If you can, simulate the actual UPCAT. Just keep on practicing your test-taking skills. Again, do not review but instead, practice! Prepare your test kit, attire and snacks. The UPCAT is not a fashion show. Wear decent and comfortable clothes. T-shirt, jeans and a pair of comfortable shoes will do. Don't forget your jacket as well. Bring healthful snacks. I suggest sandwich, apple or banana. No junk food, sweets and energy drinks. you do not want your system to crash during the exam. The UPCAT is not just about intelligence. It's also about preparing your brain and body. Don't get stressed. Don't get sick. Jog. Play light sports. Get your blood circulating. You'll feel better and rejuvenated. Practice waking up early or staying alert in the afternoon, depending on your exam schedule. Relax, watch a movie or a TV series and get ample rest. Let say you are a track and field player, would you practice and run the day before the race? Or will you save your strength for the actual race? Same goes with the UPCAT. Studying the day before the test won't help. Just save your strength for the actual test. Lift up all your anxieties and concerns to the one above. Also, have faith in yourself. Be confident. You have prepared well for this. Believe that you can do it. Thank you so much for the tips. I was really studying before reading this. I’ll do my practice tests instead. Thanks again! Thank you for this giving advance tips to us.